Still no 64bit support.. that’s really quite sad. I run PhotoShop CS4 with 64-bit Vista. What I did was go to Adobe and there is a free patch to their Codecs to include my Nikon 300s. Maybe that will work????? If that link doesn’t work, try using the search box on cnet. I input FastPictureViewer 64-bit, which took me to the above link. Nikon really disappoints on this issue. No excuse on their part for not having a free 64-bit codec for NEF files to be viewed in Windows. Spend thousands of dollars on their equipment, least they could do is provide us with that! Thankfully CNET saves the day once again! As an update. After taking a closer look and sharing the download link it was pointed out to me that this is a TRIAL version. Now, everything installed fine and I have nothing stating it’s trial in the install but that’s what CNet and FPW’s website says. Also, after searching everywhere I can’t find anything stating how long the trial period is. Well, it’s up and running now. If it comes to an end I’ll be sure to post and let you guys know. I just thought I’d mention that even though I was happy FPV was found for free and it may turn out to be trail software that hasn’t discouraged me with FPV. These guys have put effort into this software and are deserving of compensation for putting this out. My utter disappointment lies with Nikon for not offering a 64bit NEF codec to simply view your images in Windows without opening a third party software. @Paul B: Glad you found the FastPictureViewer Professional trial! Just to clarify, there are two products: the first is the “FastPictureViewer Codec Pack” and the second is “FastPictureViewer Professional”, a standalone raw image viewer application that you installed, which ships with most codecs from the first product and comes with a trial license lasting a few weeks. The FastPictureViewer Codec Pack was initially released as “donationware” for about 6 months, but unfortunately the “donation” part did not work so well despite the huge enthusiasm, so we changed the licensing and now ask for a modest fee to cover the development and testing costs, which helps us deliver a robust (and supported) product. I also found dpMagic (www.dpmagic.com) quite good. 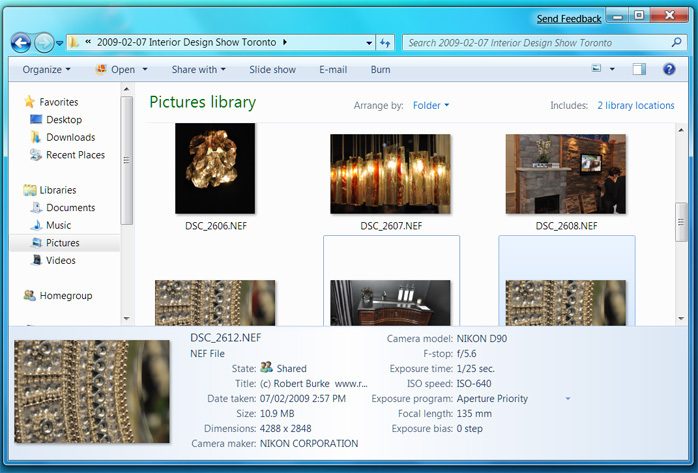 Thumbnails get shown in windows x64. The viewer is something special – works extremely fast even with my 37 Mpx photos. Guys just try fast stone image viewer 4.5 its free and it’s really worth you’ll be satisfied with the options. Microsoft has released his RAW codec last month… and it works!!!! I hope this can help some of you guys! thx, that one from MS worls indeed! A 64bit version of the NEF codec is now available by NIKON and works well on the 64bit version of Windows 7.